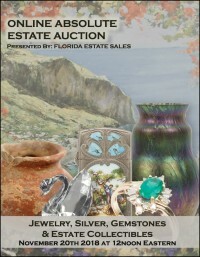 Absolute Online Estate Auction - Regardless of price - Every item will sell to the high bidder. Register & bid now on 300 lots: Fine Gold Estate Jewelry, Diamonds, Fine Fashion Jewelry, Sterling Silver Jewelry, Gemstones, Coins & Currency, Watches & Clocks, Sterling Silver Flatware & Holloware, Estate Costume Jewelry, Asian / Chinese Arts, Original Oil Paintings, Memorabilia, Statuary, Pottery, Glassware, Porcelain, Crystal, Books, Military & Wartime Memorabilia & Estate Collectibles. This comprehensive online estate auction offers an extensive assortment of quality estate personal property - consigned by estates throughout the United States. GERALD MERWER DRAWING "I'VE GOT A SECRET"
RESIN OWL STATUE "MICHAEL COLLECTION"
ASSORTED FIGURINES - PORCELAIN, GLASS, ETC. COLLECTIBLES LOT -- PINS, TOYS, KNIVES, ETC.